Click here for Ichthus Current News. We are moored on the Thames at Reading with red boards being displayed at all of the locks. Close to Caversham Bridge, water is rushing past so quickly that the red boards strongly recommend all boats stay put. You don’t get this on canals as there is very little flow, but it’s a different story on rivers. 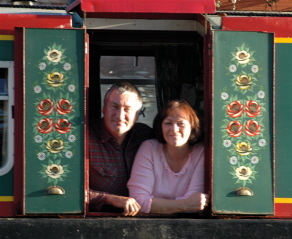 We have travelled on both rivers and canals with some very interesting and enjoyable times. We started in the spring (is it really a year ago?) here and navigated down river stopping at familiar moorings such as Henley, Maidenhead and Windsor. Then on to areas new, going through the lock at Teddington where the Thames changes. Not only does it continue to have a flow, but it becomes tidal with a rise and fall of 8' 10" (I’m sorry but I’m of an age where I don’t do metric!) and allows over 1.5 million gallons of water to flow down to London daily. From there we cruised downriver until we had the choice of turning left at Brentford and the relatively safe haven of the Grand Union and Regents Canal, or to be much bolder and continue onwards and attempt to turn into Limehouse, having gone past the Houses of Parliament, Tower Bridge and HMS Belfast. Throw into the equation the river traffic, which seems to be busy no matter when you go, and waves up to 4', discretion overcame valour, and we opted for the safer Brentford route. A combination of factors influenced our choice, but the advice of the Port of London pilot finally swayed us. There are times also in life when such decisions have to be made. Go and take a risk, or go for safety. We took what some consider being a risk when we both gave up full employment last year to concentrate on God's ministry on the canals and rivers. Some good close friends advised us not to, whilst others said “go for it!”. After much prayer we went for it, and God has continued to bless and support us ever since. At the end of May and beginning of June, a mission had been planned to bring most of the Canal Ministries team and their boats onto the Kennet and Avon Canal, with a focus around the Thatcham and Newbury area. Some two years in the planning, along with a dedicated team, produced results beyond our dreams. During the first week, in Thatcham, all the churches provided support, and Thatcham Baptist Church in particular, with the use of their facilities, financial support, printing and photocopying, and organising a canal side communion during the first weekend of our arrival. Their contact directly with the local schools resulted in nearly 1,000 children being able to come and visit the Boats of Hope. The local radio station, BBC Radio Berkshire, also came into play with a radio interview, allowing us to say exactly why we were there, as well as being one of the secret destinations on a radio treasure hunt! We were invited back to the studios on Christmas eve to reflect on the year for Canal Ministries, Boats of Hope, and a Christmas message. We again had two options, an easy blow by blow chronicle of what had gone on, or a bolder message. Well, it seemed like two options, but the latter was the right one. And here’s why. After the mission, we went back to the Thames and travelled down to Staines for a couple of days, to rest and recharge ourselves. As we came alongside the pontoon, Barbara tripped on a mooring ring, and fell backwards into the river. The mooring rope was wrapped around her so she couldn’t swim, and when she floated to the surface, she started to be dragged under the pontoon. I quickly tied the boat up, and rushed to her, but the distance between the river surface and the landing stage was too great for me to be able to lift her out. Unsurprisingly, Barbara was in shock, but I was able to get my arms under her and hold her still. I then said the first thing that came into my head which was “don’t worry, you’re safe, I'll never let you go“. Eventually, with the help of a passer-by and an abandoned supermarket trolley in the water, we managed to get Barbara out. This event had been picked up by the radio interviewer during a casual chat before the broadcast, and he asked her on air about her near death event. Rather than taking the easy route and simply telling the tale, she was bold enough to link her being pulled to safety, and how God's arms are around us too. We continue to be supported by a wonderful family and friends in Canal Ministries, churches and other groups, where we have both been able to speak about our adventures past and those for the future. Our love and thanks go to all who have supported us in the past, and to those who are willing to support us in the future. Canal Ministries - sharing God's Love on the Inland Waterways.